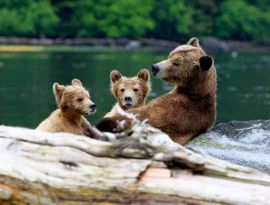 The Great Bear Rainforest is critically important for North America's remaining grizzly bears - it is the most southerly coastal grizzly bear population remaining on the Pacific coast and acts as a stronghold for North America's remaining grizzlies. 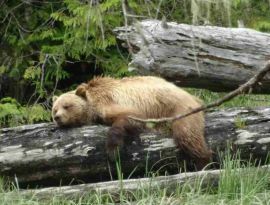 Before Europeans arrived in North America, a vast network of grizzly bear (Ursus arctos horribilis) trails existed between California and Alaska. Today the southern extent of the grizzly's range has been destroyed, largely by habitat loss from logging and urbanization. Only a few small isolated patches of habitat are presently occupied by grizzlies below the 49th parallel. The " great bears" of coastal BC grow to very large sizes (some over a thousand pounds). Most of this can be attributed to their salmon rich fall diet. The hump on the grizzly's back that distinguishes it from a black bear is a thick wad of muscle which enables the bear's powerful digging ability. Grizzly claws, which can be four to six inches long, are slightly curved and adapted more for digging, as opposed to the hooked claws of black bears which are adapted for tree climbing. Grizzly bears have the lowest reproductive rate of any North American mammal. One reason for this is the late sexual maturation of female grizzlies, as they do not start breeding until 5 to 8 years of age. If optimum conditions exist, breeding females will produce only one to three cubs per litter at 2 to 3 year intervals. One third of all litters die before the end of their first year, and at least 70 per cent of all young die before reproducing. Check out our YouTube channel for some great footage from our remote cameras! BC boasts one of the highest populations of black bears in the world with their numbers being somewhere between 120 and 150 thousand animals. 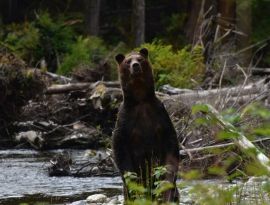 Pretty much all of BC is considered “bear country” with bears inhabiting everything from the coastal forests, through to the interior grasslands. One of the most widely distributed mammals, Black bears have low reproductive rates compared to many other mammals. Females usually don’t reach sexual maturity until four years of age and breed only every two to three years after that. In areas of abundant food, they may reach maturity sooner. Where food is scarce females might not bear their first litter until they are six or seven years old. Although some males can breed when they are one and a half years old, in most populations males don’t mature sexually until age five or six. Black bears in British Columbia usually mate from early June to mid-July. However, in a phenomenon called delayed implantation, the embryo does not implant in the uterus and begin developing until October or November. Cubs are born in January or February, during hibernation. Black bears usually have two cubs, but litter sizes vary from one to five. At birth, cubs are hairless, blind, and weigh about 400 g. They nurse while the mother continues hibernating and weigh 3 to 5 kg when they leave the den in spring.